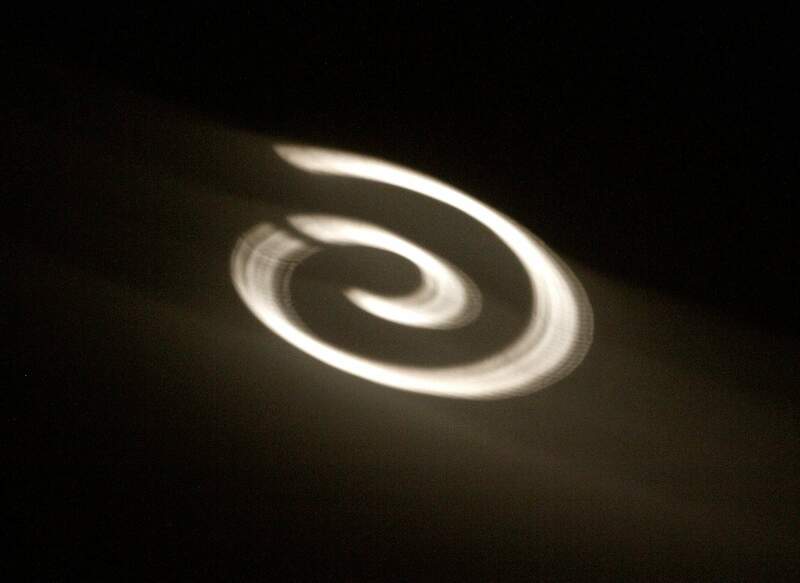 Light passes through a window – a 50-pound block of precast concrete with an opening in the shape of a spiral – and projects on the opposite wall early Friday morning in the Great Hall at the Center of Southwest Studies. The spiral is formed at the summer solstice by the rays of the sun passing through the “Solstice Window” created by Scott Parsons. The annual event attracted 35 visitors. “I read about it and just wanted to see it,” Holly Jobson said. 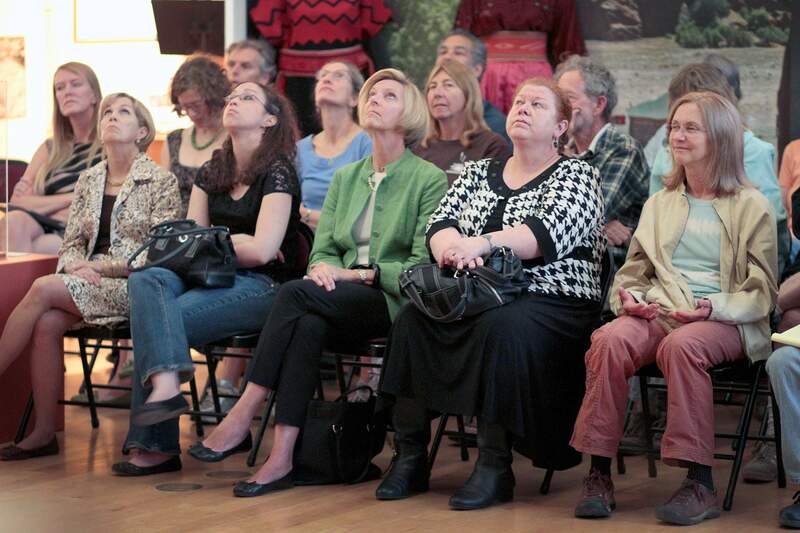 The lure of pre-Columbian astronomy brought 35 people to Fort Lewis College early Friday to watch the sun creep through a solstice window to usher in the longest day of the year. Sun rays projected an artist’s rendition in glass of a spiral design used by Uto-Aztecan cultures across the new world onto the opposite wall of the exhibition gallery in the Center of Southwest Studies. The annual light show lasted just short of an hour, from about 6:15 to 7:10 a.m., as the spiral brightened, changed shape with the path of the sun, disintegrated and faded. It was the first view of the solstice window also for Holly Jobson, who has lived in Durango 25 years. “I read about it and just wanted to see it,” Jobson said. Officially, Friday’s sun was with us from 5:51 a.m. to 8:35 p.m., a total of 14 hours, 44 minutes. The official start of summer was 11:04 p.m. MDT on Thursday night. Scott Parsons, a Denver artist, was commissioned to create the window through the Colorado Art in Public Places program. The glass is encased in a 450-pound block of concrete that was set in place in May 2000 and dedicated at the solstice observation the next summer. Parsons, who visited several solstice sites in the Southwest, developed the concept and designed the solstice window, which measures 18 by 22 inches, during three years. A friend, astronomer Don Asquin, worked out mathematical formulas to determine the location of the window, fitted into the upper northeast corner of the exhibition gallery. The solstice celebration is an annual event at the college. The spiral is visible for about 20 minutes every morning during the week before and after the solstice. But it’s at its sharpest on solstice day.